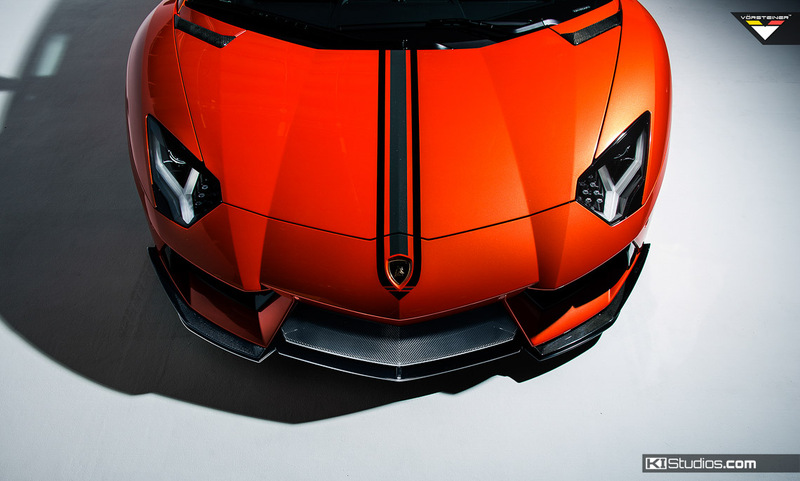 Lamborghini Aventador Stripes. There is no better example of one of our proprietary stripe kits put to good use, with a bit of custom flair. 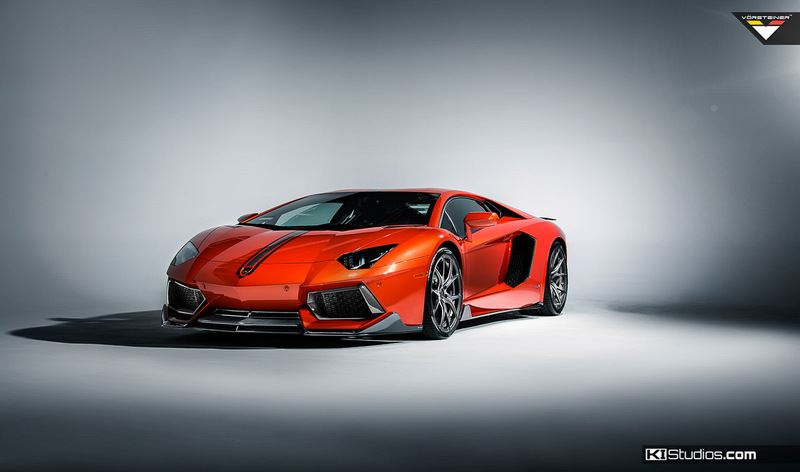 This is the Vorsteiner Lamborghini Aventador in gorgeous Arancio Argos color scheme. 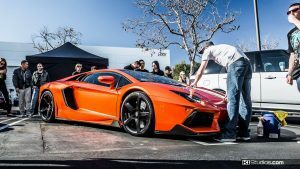 This Arancio Argos Lamborghini Aventador brought to us by Vorsteiner is a perfect way to showcase our Lamborghini Aventador stripes. 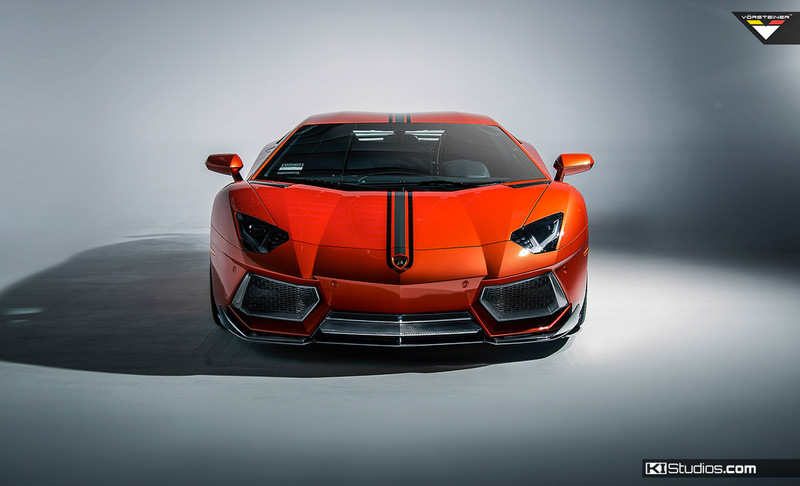 This Lambo features the Aventador 002 stripe kit from KI Studios with a slight variation. We worked the Vorsteiner logo into the stripe itself at the frontmost “V” of the badge surround. Regardless, the Aventador stripe kit 002 is based on kit 001 with the addition on a second color. This is a kit that is also very popular on other cars such as the Lamborghini Huracan. 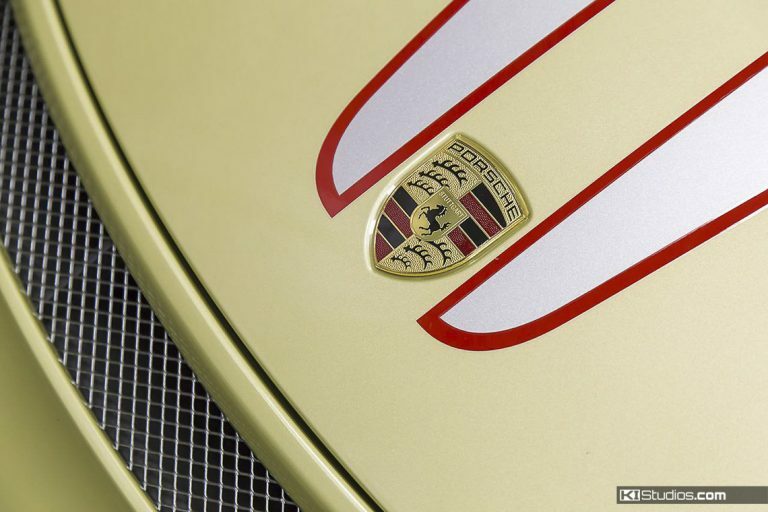 It features dual color stripes and a badge surround. This particular car is wearing one of the first pre-production vinyl stripes designed for this car. It presented a way to try out the graphics and gauge the success of them based on people’s reactions to it at car shows. Needless to say, the car’s look was a smashing success and now this is a proven design. This very popular kit offers a very easy, simple and safe way of enhancing the look of any Lamborghini Aventador without having to go too overboard with stripes and graphics. In other words, this one goes along the lines of less is more. Classy, yet bold. The simpler design also means easier applications. 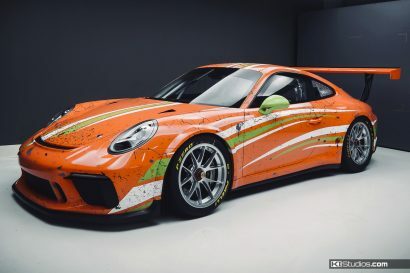 While our full wraps and paint protection film jobs require that someone with experience install them, these stripe kits are a lot easier and safer to install. Just about anyone with decent motor skills, a good eye and some patience can install them with professional results. If you mess up, you’re not out on thousands of dollars. These simpler kits are a lot lower in overall cost than full graphics or wraps. 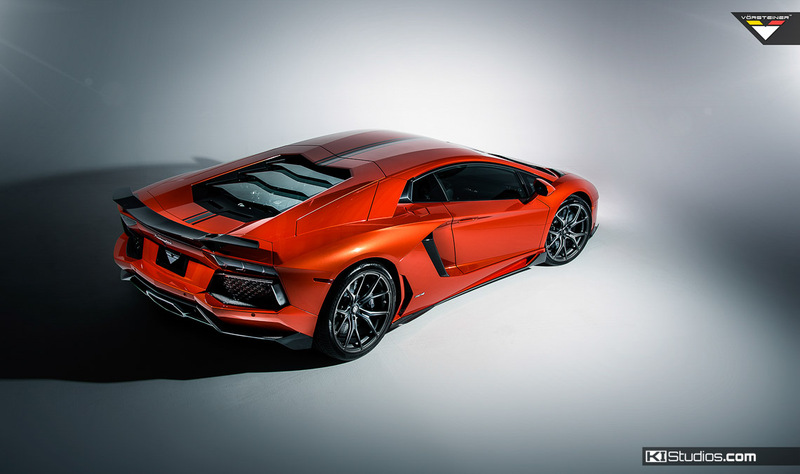 For the last few years, the Aventador has been the flagship car for Lamborghini. This is without counting the super special units like the Veneno and the Sesto Elemento. As a production Lamborghini, this is the “Big Lambo”. It is in fact quite big. You can really see it when put side-by-side with a Huracan. As the flagship car in the current Lamborghini lineup, it is up there in price range. The base car starts at about twice the price of a Huracan. Like all big Lambos it has a V12. The V12 in the Aventador is a 6.5-liter with 691 hp and a 7-speed automated manual transmission coupled with all-wheel drive. The car is famous for shooting flames out the big tailpipe when on wide-open throttle. 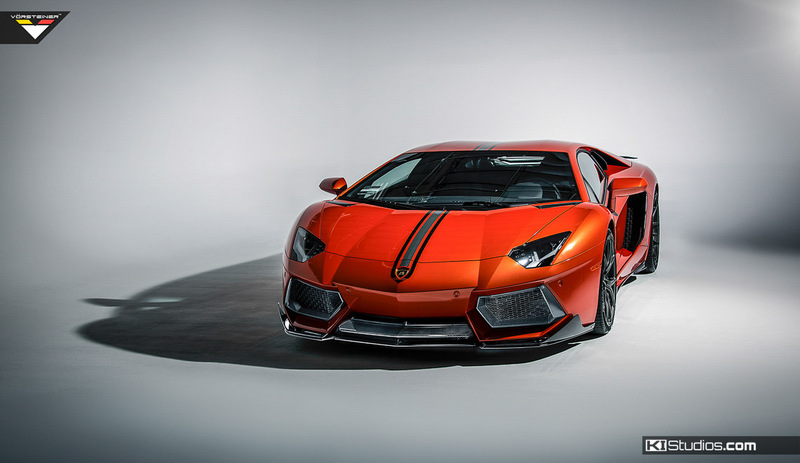 The official name of the color on this Vorsteiner Aventador is “Arancio Argos.” Arancio is Italian for orange.